Perhaps you're a coin collector from the days of the 1950s or 1960s, when you could still buy Morgan silver dollars and Peace silver dollars from the bank for face value. Or, maybe you recall the 1970s and early 1980s, when Eisenhower dollars and Susan B. Anthony dollars were circulating widely and could be readily obtained from banks and other places for face value. You likely even remember the early 2000s, when the Sacagawea golden dollar promised to revolutionize the way people spent dollar coins. Sadly, circulating dollar coins seem to be a thing of the past. Today, it's getting harder and harder to find dollar coins in circulation, and fewer banks seem to be carrying them. What's happening? 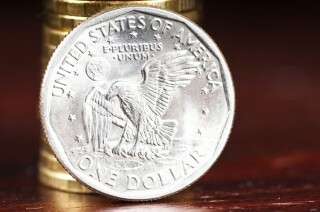 Can you still find dollar coins in pocket change? The reason dollar coins tend not to circulate well is mainly due to the continued prevalence of one dollar face value paper currency. Dollar bills are more popular among the public than dollar coins largely because paper money weighs less, dollar for dollar, than coins do. Yet, many government studies suggest taxpayers could save hundreds of millions of dollars each decade if dollar bills are withdrawn from circulation and replaced by dollar coins. It costs about 6 cents to print a dollar bill and 10 cents to strike a dollar coin. So how are savings derived from replacing dollar bills with dollar coins? The average lifespan of a dollar coin is 30 years versus about 24 months for the dollar bill. That means for every 10 to 20 dollar bills that will need to be produced over the course of 30 years, only a single one dollar coin would need to be struck. If dollar coins are so cost efficient, then where are the dollar coins today? In 2012, the United States government stopped issuing them for circulation as the coins failed to circulate very widely and were stacking up in bank vaults. By 2012, more than 1.1 billion dollar coins were sitting in government vaults. Those that are still "out there" somewhere have largely landed in the hands of coin collectors or those who saved them in change jars, thinking the coins are worth substantially more than face value (most of the modern ones aren't if they're worn). While they scarcely are ever handed out as change for cash transactions, dollar coins are still available from many banks. Those who seek roll quantities of dollar coins may need to place special requests for them from the bank or order them from the United States Mint. Of course, coin dealers also sell dollar coins, but these are often sold at significant markups over the face value of the coins themselves due to their collectability. You might also seek retailers who promote the usage of dollar coins in circulation. Such establishments often readily hand out dollar coins as change in transactions in which a dollar bill(s) might be ordinarily used. The goal? To encourage people to use dollar coins and normalize the circulation of these coins. So far, such efforts don't seem to have worked very well. If the dollar bill were out of the way, this narrative would probably – very plausibly – have a different ending. For now the dollar coin is relegated to coin collections, change jars, and bank vaults. But perhaps the story isn't over for circulating dollar coins. If legislators ever again pursue transition the United States to using a dollar coin, and does so while withdrawing the dollar bill from circulation, then dollar coins will certainly live on to see another day.